Although I have many photos around the house, and many of people I just don't know, this postcard is only two-thirds unknown. The man on the far left is my father. Another real photo postcard is a portrait of him alone. 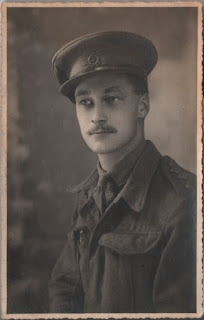 I thought this might possibly have been taken at the same time in spite of the deckle edge on the second because I noticed a pen in my father's top right pocket in both pictures. He may have done that habitually of course. An inspection of the reverse showed the names of the card used. Two different sorts so most likely developed, if not taken, at different times. 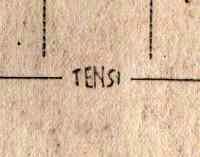 Both Ferrania and Tensi are the names of Italian firms and both these logos on photographic paper were in use before 1945. My father was posted to Italy towards the end of the war and stayed until the end of 1946, so that ties in well. Sadly so many military photos are filled with unknowns, but they are still worth saving when you know at least one. In the days before modern cellphones and email, soldiers could be years away from their family and these photos were an important memento to send home. Yes, I do have many more with many more unknowns. A pen showing in hispocket is a risk that he would have been accused of being improperly dressed! My father was always and forever improperly dressed. That is such good advice - to turn our photos over and examine the detailed clues such as the photographic printers. And such fine photos too. Yes,I imagined these photos would have given great comfort to those waiting&worrying at Home. Your Dad was very handsome. I love how they made photos into postcards back then. If only names were written on the back as we can't ask our relatives now. Good-looking chap your father, improperly dressed or not. On both photographs, everything except for part of the faces looks unusually dark. I wonder whether that wa a preferred style or if it shows a lack of photographic lightning. He looks ever so slightly older to me in the second picture. Maybe it is just the pose. Great photos and good sound advice- it's funny how photos can give us so many clues on both sides! Well the only comment I can offer is that he is wearing different hats in each photo but I know zip about uniforms. 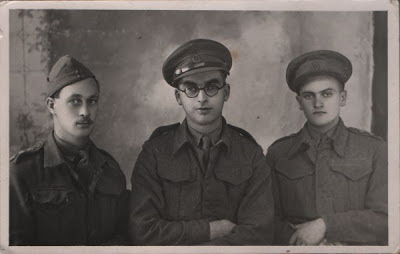 You might be able to identify the cap badges for the two other soldiers in the first postcard portrait. Perhaps they served alongside your father in Italy. What a handsome father. He looks a bit like Errol Flynn. Nancy and I are on the same page -- I was thinking his solo portrait looks like those old photos of movie stars, especially ones from the silent era. I guess it's something about his eyes. What a good looking man your father was. A lovely photograph to have in your collection. What lovely photos! Your father was so handsome! I love going through photos of my grandparents and family from the 30s, 40s and 50s. They were all so stylish and beautiful.